Don't EVER hit the snooze button. It really is much more beneficial to just get up on your first alarm. 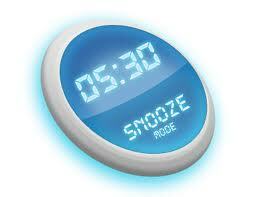 Think about it – the snooze button gives you an extra 10 minutes or so sleep. In the grand scheme of your day this really won't provide you with any more energy. In-fact it does the opposite. Research has shown that 'interrupted sleep' can cause us to feel more tired.